Los Angeles Mayor Eric Garcetti’s Great Streets Initiative is hosting its second round of challenge grants. The grants help community partners create projects that make Los Angeles streets more safe, active, and fun. The focus is to get community groups working together to re-envision and to improve streets all over L.A. The scope of this year’s Great Streets Challenge Grants has expanded in a couple of ways. This year’s grants are not limited to the fifteen designated Great Streets segments, but can be used “for any street in Los Angeles you think should be great” though the grants prioritize “projects located in areas that help the city achieve its social, economic, mobility, environmental, and public health goals.” This primarily means streets already identified as transit, walk, and bike priority according to the city’s Mobility Plan 2035. Though it can also include streets prioritized in the Vision Zero High Injury Network, the Plan for a Healthy Los Angeles, Safe Routes to School Strategic Plan, Sustainable City pLAn, and/or the fifteen Great Streets segments. The various priority networks are shown in this interactive map. Grants are not for individuals, but for non-profits, including Chambers of Commerce, BIDs, places of worship, and also schools and universities. 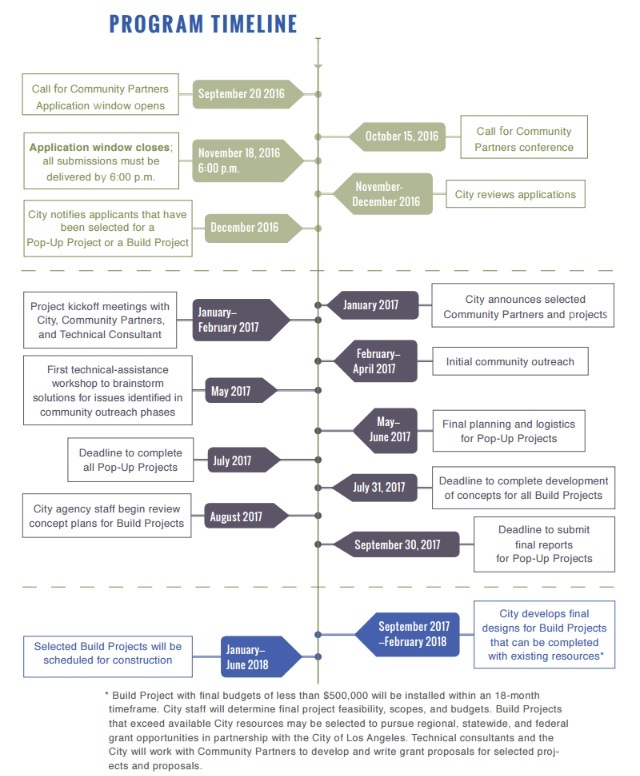 Grantees will receive outreach grants of up to $13,000, plus city technical assistance for design and construction resources. Applications are open now for Great Streets Challenge Grants. Workshops are coming up next week. Applications are due November 18. 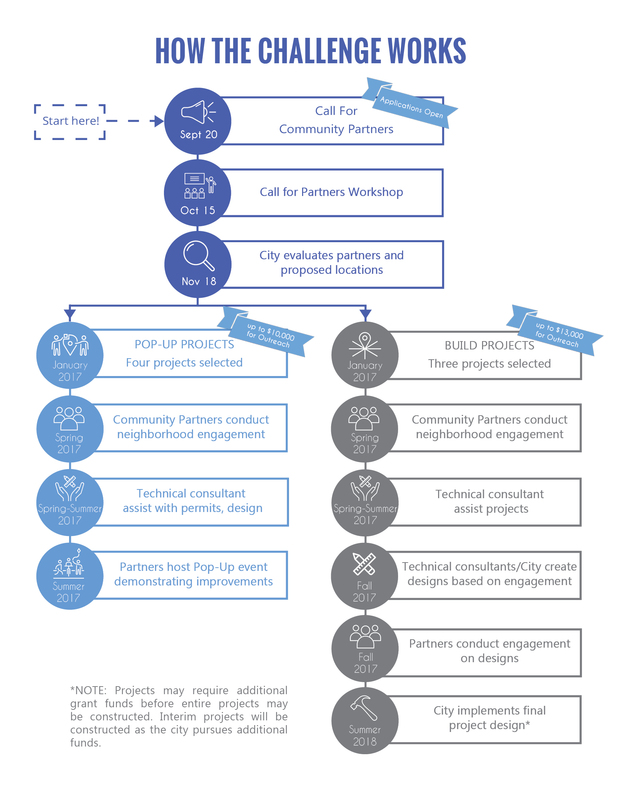 Groups interested in grants should plan ahead to form partnerships to ensure successful applications. An in-person, informational workshop will be held at 10 a.m. Saturday October 15 at L.A. City Hall in downtown Los Angeles. Alternately, a webinar will be held at 12:30 p.m. on Wednesday October 26. For workshop details and to preregister, go to the Great Streets website. Grant applications are due November 18. Winners will be announced in January 2017. There is additional information, including application forms, in the Great Streets Challenge Guide document online. Past Great Streets Challenge Grant winners hosted events from music festivals to block parties to family bike rodeos. Many grantees demonstrated safety upgrades from scramble crosswalks to protected bike lanes. Though, the sky is the limit this year, with an expanded palette of street sites and temporary and permanent projects. What would you and your neighbors do on a street in your area?